Developing Standards is a fairly dry occupation at the best of times and yet many in the industry give of their time (often voluntarily) to help ensure that all of our working - and indeed our personal - lives benefit in all manner of ways, whether by ensuring a safe workplace or that our equipment operates as we expect it to. Having held the helm of the British Standards for Imaging Committee CPW/04 for the last six or so years, Dave Roberts has decided that the leisure activity opportunities offered by retirement are more attractive than running a BSI committee. Those who’ve been involved in standards development work will appreciate that such a choice is an easy decision to make. CPW/04 as a committee is best known more recently for the development of BS 7909, the Code of Practice for temporary electrical systems for entertainment and related purposes. Unbeknown to many it is also responsible for ensuring that colour filters (gels) are made in a suitably flame-proof fashion (BS 3944); that others understand film and TV terminology (BS ISO 4246 - Cinematography. Vocabulary) and it also has responsibility for the ageing BS 5555-7.5.4 standard that deals with the BAC single pole connector used in film and TV. At a meeting of the committee to discuss forthcoming amendments to BS 7909 (of which there will be some) Dave formerly handed over to industry stalwart Mark White of ETC who will bring many years of experience to the post and will also help promote the interests of the theatrical side of the business on a committee that has historically been dominated by the broadcasting and film industries. As the interest and adoption of BS 7909 grows throughout the industry Mark is well placed to act as an ambassador for electrical safety; in his capacity as chairman of ABTT and also the Theatre Safety Committee he has already written a forward and contributed to the new IET guidebook on temporary power. Written by LSi’s former technical editor James Eade, the book has already sold out on pre-orders despite not even being due to hit the shelves until October. Mark therefore takes over the running of a committee which - for dry old standards work - is actually quite an exciting time. 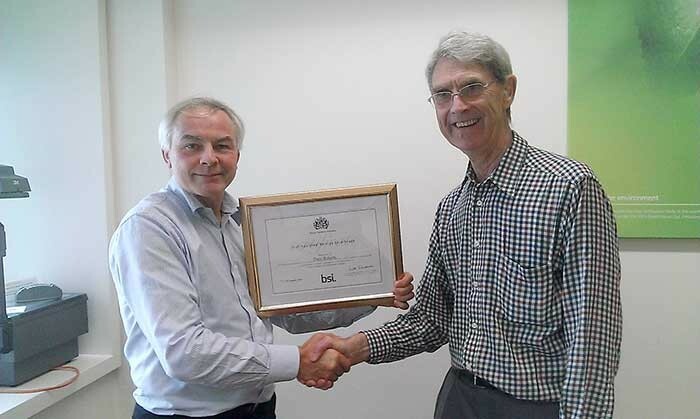 The committee would like to formerly thank Dave for the significant effort he has put in to bringing the committee to this stage as well as his considerable contribution to the content of BS 7909 itself. His efforts have also been recognised by BSI which awarded him a certificate for his service. But, in true standards style, the certificate was personally presented by BSI secretariat number 0019. Semper idem….